Sightseers in Manchester in need of a culture fix may like to head on down to the best of the city's museums, where many fascinating exhibits about the area's rich past await. Further museums are to be found just outside of Manchester, in neighbouring towns such as Ashton-under-Lyne, Bury, Macclesfield, Oldham, Rochdale, Salford and Stockport, amongst other destinations. Situated close to the Granada Studios, the Museum of Science and Industry in Manchester is often abbreviated as simply 'MOSI' and is dedicated to the world of science and technology. Themed sections concentrate of topics such as computers, power, sewerage, textiles and transport, where exhibits range from steam trains to space rockets. Especially popular are the regular steam train rides, with the carriages being pulled by a splendid working replica of Robert Stephenson's revolutionary 'Planet' locomotive. The Chadkirk Chapel Museum, in the Stockport area, is housed in a historic chapel, which dates back more than 500 years. Attractions at the Chadkirk Chapel include local artefacts and interesting audiovisuals, explaining the local history of this popular area. Situated in the heart of the busy city centre, the Museum of Science and Industry is particularly popular with children of all ages. Attractions here include many interactive exhibits from the world of science, both past and present. The Macclesfield Silk Museum, to the south of central Manchester, recalls the history of silk making around the world. Other attractions include a gift shop and a restaurant. The Jewish Museum is one of the most interesting religious attractions in the city and is housed in a spectacular synagogue in the Cheetham area. The Museum of the Manchesters is sited within the city centre and is a popular military attraction, featuring a large and impressive collection of military memorabilia, including historic medals, uniforms and interactive displays. The Pankhurst Centre celebrates the life of the famous Emmeline Pankhurst, who once lived in Manchester. Famous for leading the suffragette movement in the early 1900s, highlights at the Pankhurst Centre include exhibitions with historic documents and photographs. The Pankhurst Centre is located in the All Saints area. 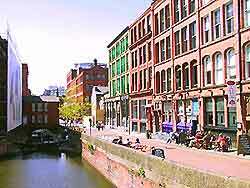 The Portland Basin Museum is situated in a vast canal warehouse and celebrates the historic crafts and city life, with displays include the impressive reconstruction of a street in the early 20th century. 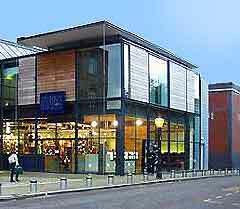 The People's History Museum is situated in the centrally located Pump House. Noteworthy highlights here include reconstructions of city life over the last 200 years, many historic documents and a number of hands-on exhibits, which are particularly popular with children. The Greater Manchester Fire Service Museum, in the Rochdale area, documents the history of fire fighting in the city. With numerous historic fire-fighting relics from the area and Victorian scenes, this serves as a popular attraction with the whole family. Located in the city centre, the Greater Manchester Police Museum features a vast collection of local police history, which dates back to the mid-19th century. Attractions here include historic police uniforms and many historic police-related exhibitions. The Rochdale Pioneers Museum, in the town of Rochdale, was founded more than 150 years ago. Remembering the success of the Rochdale Pioneers, which became an enormous worldwide business, the multitude of interesting exhibits date back many years. Located in Rochdale, close to the city, the Ellen Road Engine Museum is one of the most popular in this area and is home a several enormous steam mill engines, which are still in working order. The Ellen Road attraction is within easy reach of the city centre and other enticing features include seasonal exhibitions and events. Sited in the outlying Lancashire town of Bury, the Royal Regiment of Fusiliers Museum showcases the history of the region's important Royal Regiment of Fusiliers, with interesting artefacts and exhibits dating back more than 300 years. The Stockport Hat Works Museum stands just outside of the city and is one of the area's most unusual cultural attractions, with many informative displays about hat making. Other attractions at the Stockport Hat Works include hands-on exhibits, a café and gift shop. The Stockport Vernon Park Museum, in the nearby town of Stockport, is a popular Victorian museum, full of an enormous amount of local history, from the Stone Age to present day. Highlights at the Stockport Vernon Park include many interactive computers and fascinating local artefacts. Celebrating the legendary Manchester United Football Club in Old Trafford, which has produced world-famous football players include David Beckham and Michael Owen, this has become one of the most popular sporting attractions in the city. Covering more than a century, highlights here include many of the club's impressive trophies and guided tours of the football stadium. The Ordsall Hall Museum stands on the outskirts of the city and was founded in the 1970s. Featuring splendid Tudor architecture, historical exhibits and seasonal events, there is also interesting information about Guy Fawkes, who is believed to have plotted in this very building. The Bolton Museum and Art Gallery can be found in the town of Bolton, within easy reach of the city, and is home to many interesting archaeological artefacts, historic exhibits, paintings and contemporary sculptures. Bury Art Gallery and Museum, in the town of Bury, is home to fascinating reconstructions of historic shops, local craftworks and a number of landscape paintings by famous artists, including the likes of Constable. The Saddleworth Museum and Art Gallery, in nearby Oldham, is full of local Lancashire history, with highlights including details relating to Victorian times in this area. The Museum of Transport, on the northern side of the city, is one of the largest transport museums in England. Featuring countless buses, trams, cars, motorbikes and other historic vehicles, other attractions include a large amount of transport memorabilia and frequent open-top bus rides. The National Museum of Labour History, in the Aytoun region, celebrates the lives of the working class throughout the country.